Ancient settlements occupied low islands beside the River Ouse. 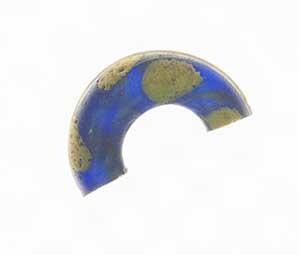 A glass bead coloured blue with cobalt. It was found in the Iron Age settlement and could have been part of a necklace. The earliest settlement was a small ‘village’ near to the river, which was occupied during the Iron Age between 2,800 and 2,000 years ago. A small community of families lived in earth-walled and thatched round houses built close to each other on dry land. Each family gathered around the hearth in the centre of their house for warmth and light, and to cook and share stories. Without a chimney, the smoke would have filled the house as it gently rose through the roof. The area nearest the light from door was used for preparing food and making or mending everything from tools to clothes. Families slept in the part of the house opposite to the door. Each house was inside a small compound divided from others by ditches with hedges or fences beside them. The families farmed the marshy ground around the settlement to raise sheep and cattle as well as grow crops. This is not the only Iron Age settlement found and excavated around Bedford but it is one of the biggest. Most were individual farmsteads settled alongside rivers, many beside the Ivel and Great Ouse. Larger village-like settlements like the one in Bedford River Valley Park were rare. 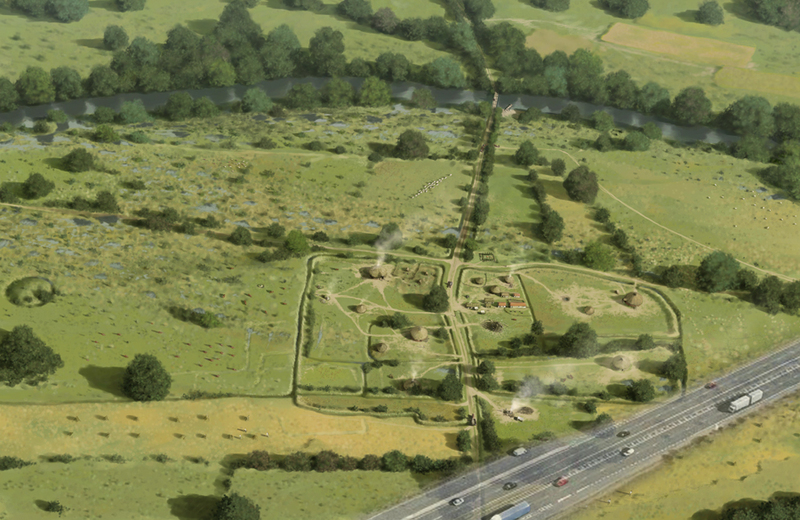 During the Roman period the community upped-sticks and moved the settlement 250metres (820 feet) to the east. They carried on living in round houses rather than Roman-style rectangular houses. Were they too poor to adopt the ‘latest designs’ or unwilling to live like their new rulers? Families continued to enclose their compounds with banks and ditches planted with hedges. They buried their dead in a cemetery alongside the cart-rutted road running between the settlement and the Great Ouse. Travellers crossed the river by a ford or timber bridge. 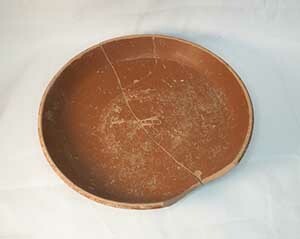 Potters turned the local clay into bowls, dishes and jars in small wood-fired kilns. Families drew freshwater from wells sunk deep into the gravels. 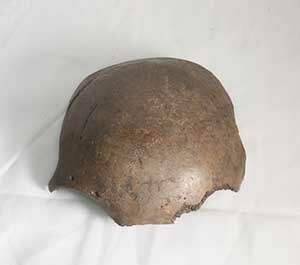 Romano-British settlements have been found elsewhere in Bedfordshire. While most are individual farmsteads, a few larger settlements were created. Some originated in the Iron Age, while others were settled during the Roman period. A wealthy farmstead with bathhouse stood where Priory Lake is today. At Biddenham Loop, an extensive roadside ribbon settlement on the western side of the river was connected to four farmsteads located inside the oxbow loop by a trackway and ford. The farmsteads were established during the Iron Age. At Marsh Leys, on the outskirts of Bedford, there were five Romano-British farmsteads about 400 metres apart from each other. These were part of a string of individual farmsteads next to Elstow Brook. They were founded in the Iron Age and comprised round houses within small, individual ditched enclosures which continued in use after the Roman Conquest. Rectangular fields replaced the earlier enclosures during the 2nd century AD, and a small number of rectangular buildings were constructed to replace the ‘traditional’ round houses.